Death By Salt? New Study Finds Too Much Sodium Is A Global Killer : Goats and Soda It's not just Americans who are oversalted. 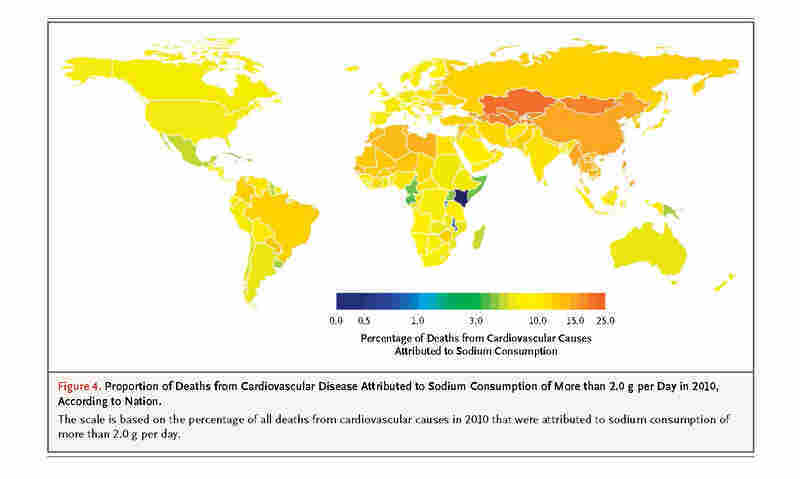 A new study reports that sodium takes a global toll, attributing 1.65 million deaths from cardiovascular disease to sodium consumption. Americans are accustomed to being nagged about salt. We're told we consume too much — particularly from processed foods. And that all this salt can increase the risk of high blood pressure, heart attacks and strokes. Turns out it's the same story most places around the globe. Worldwide, people consume an average of 3,950 milligrams of sodium a day, according to a new study published in the New England Journal of Medicine. And though there are regional daily differences, ranging from about 2,000 milligrams to 5,500 milligrams, the global average is nearly double what the World Health Organization recommends. This salt overload is taking its toll. The study concludes that about 1.65 million deaths from cardiovascular disease each year can be attributed to sodium consumption. "That's remarkably high, that's almost 1 in 10 of all cardiovascular deaths around the world," Dariush Mozaffarian, a study author and dean of the Friedman School of Nutrition Science and Policy at Tufts University told us by phone. "This suggests that a single factor in the diet [salt] could be contributing to almost 10 percent of the cardiovascular burden." To get a picture of global salt consumption, Mozaffarian and his colleagues collected survey data on sodium intake from 66 countries. And they analyzed more than 100 prior studies to assess the effects of sodium on blood pressure and cardiovascular disease. So, where are the global hot spots, when it comes to death by salt? 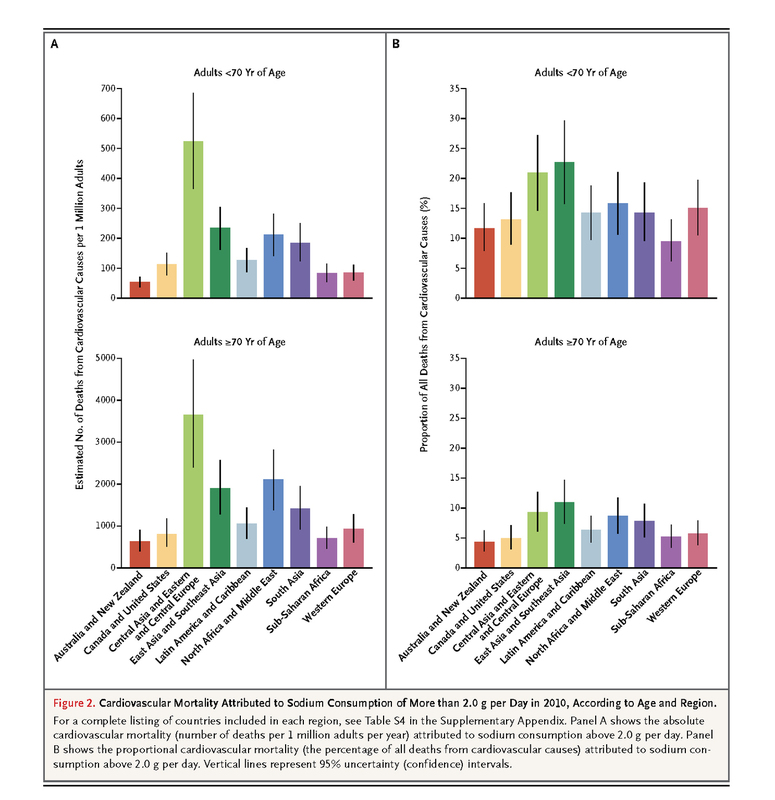 This study finds that (see figure 2 and figure 4) the proportion of deaths from heart attacks and strokes attributable to sodium ranges quite a bit. In Canada, the United States, Australia and New Zealand, about 10 percent of cardiovascular deaths (among people 70 and younger) are linked to high salt intake. But there's a wide band in the study map, stretching from Eastern Europe all the way across into Central Asia and East Asia. There, the percentage of cardiovascular deaths attributed to sodium consumption jumps up to 20 to 25 percent. "What seems to be linking those countries [in this band] ... is that this is the Old Silk Road [trade] route, where people traveled many distances and needed salt to preserve their food," says Mozaffarian. 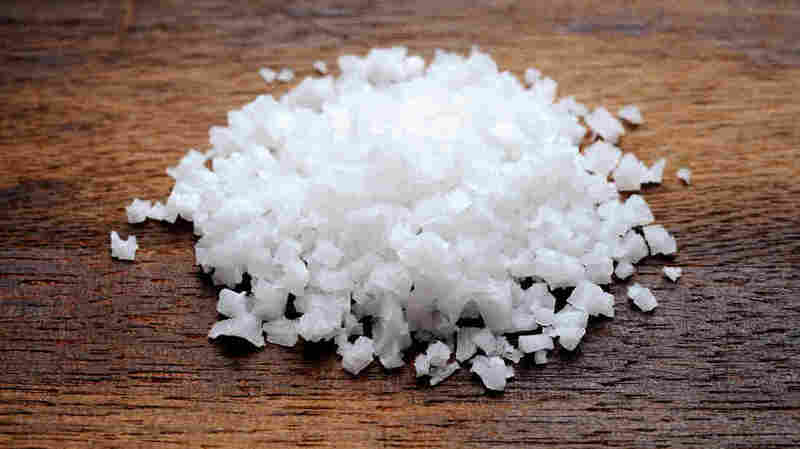 Centuries later, this tradition of eating salt-preserved foods remains strong. Not all researchers are convinced that consuming high levels of sodium is harmful. In fact, the same issue of the New England Journal of Medicine published another study that questions whether recommendations for low sodium consumption are valid for everyone. The study found the link between sodium and cardiovascular disease is strongest when blood pressure is elevated — and that potassium, a nutrient found in fruits, vegetables and beans, can help lower blood pressure. The study suggests that if you don't have high blood pressure, it might be okay to consumer 3,500 milligrams of sodium a day, as is typical among Americans. The author of this study, Dr. Salim Yusuf of McMaster University in Canada, told the AP, that it's better to focus on healthy patterns of eating instead of a single element. "That is something everyone can rally around," Yusuf told the AP. The new studies may add to the debate among scientists, policymakers and public health experts who have been putting pressure on the restaurant and food industries to incrementally reduce sodium levels.